Martial arts are often attributed to South-east Asian countries, namely China, Japan and Korea. However few people know that the idea of martial arts originated in a least expected part of the world. The region is none another than the Indian sub-continent. The term kalaripayattu is a compound from the words “kalari” meaning school or gymnasium (similar to Dojo in Japanese) and “payattu” derived from payattuka meaning to “fight / exercise” or “to put hard work into”. 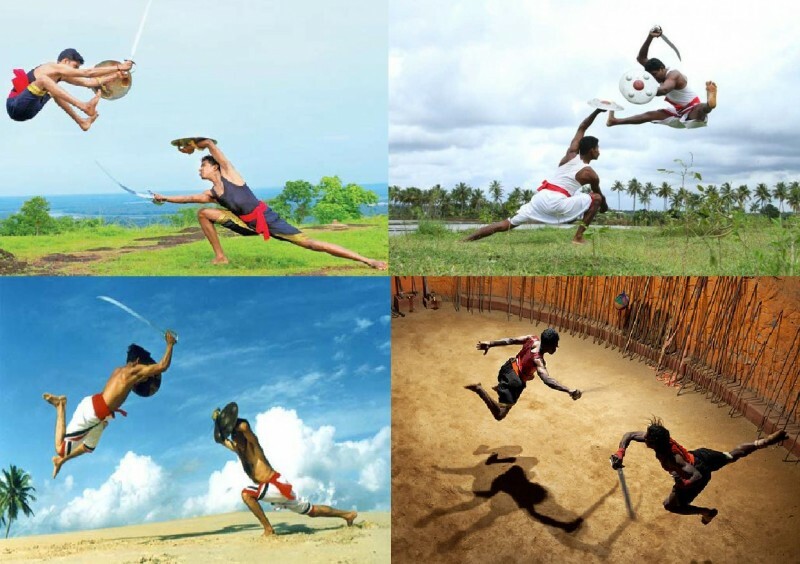 The practice of Kalaripayattu is said to originate from the Dhanur Veda — an ancient Indian texts. Although the Dhanur Veda means the “science of archery”, it encompassed all the traditional fighting arts. The explicit concern in Dhanur Veda texts is not with battlefield strategies, but rather with training in martial techniques. This martial art form is indigenous to the Southern Indian state of Kerala which, legend has it, was created by the warrior saint Parashurama, an incarnation of Lord Vishnu. Parashurama established forty-two kalaris (Schools) and taught twenty-one masters of these kalaris to protect the land of Kerala. Kalaris are the schools where training in this martial art form is imparted by Gurukals or masters. Martial arts have been in existence on the Indian sub-continent for thousands of years. Long ago, animal fighting styles were imitated by pre-historic man which was a system for survival. The first weapon used was the stick which was an extension of the arm. Various weapons were later invented during the Stone and Iron Ages. Even in Vedas they have mentioned about martial arts. The various movements in Kalari are based on animal movements. Several poses are named after animals. Hence it is generally believed to have developed in the jungles when hunters observed the fighting techniques of various animals. Kalaripayattu became more developed during the 9th century and was practiced by warrior clans of Kerala to defend the state and the king. Kalaripayattu reached its pinnacle of glory during the 100-years-war between the Cholas, Cheras, and Pandyas in the 11th or 12th century CE. Training in combat is given at the Kalari (training school). The principles of Kalari education stipulate that training in martial art begins with an oil massage of the body which goes on until the body is agile and supple. Feats like chaattom (jumping), ottam (running), marichil (somersault) etc. are then taught, followed by the lessons in the use of weapons such as daggers, swords, spears, maces, the bow and arrow and so on. Attacks in this martial art include kicking, grappling and striking, both with weapons and without. Beyond the lethal blows delivered by swords and sticks, warriors practicing kalaripayattu can disable or kill their opponents by a mere touch of the opponent’s Marmam points on the body. Marmam are the same vital points of human body that form the basis of India’s ancient healing system, Ayurveda. Because of this advanced knowledge, kalaripayattu practitioners were also skilled in traditional medicine and massage, which was a necessary skill to learn when getting banged up so badly in combat or even just while training. 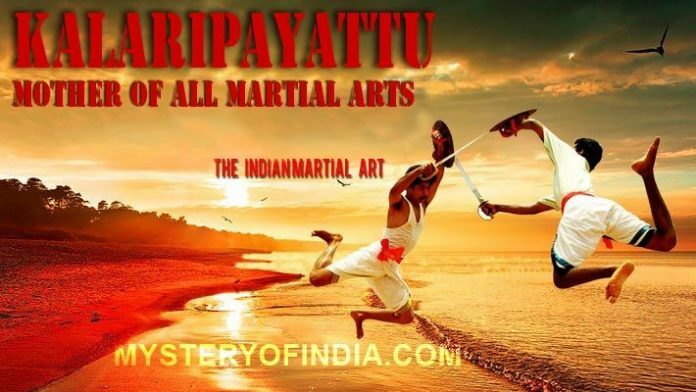 Kalarippayattu teaches about 108 vital points in the human body. This technique is taught only to the promising and level headed persons, to prevent its misuse. In Rigveda it is mentioned that lord Indra defeated the demon Vritasura using one of the marmam techniques of Kalari. Sage Sushruta, one of the famous Indian Ayurvedic medical practitioner and researcher who lived in 6th century BC identified and defined 107 vital points of the human body in his book Sushruta Samhita. Of these 107 points, 64 were classified as being lethal if properly struck with a fist or stick. Kalarippayattu is believed to be brought to China by Bodhidharma, a Buddhist monk who lived during the 5th/6th century CE. He is traditionally credited as the transmitter of Ch’an (Sanskrit: Dhyāna, Japanese: Zen) to China, and regarded as the first Chinese patriarch. According to Chinese legend, he also began the physical training of the Shaolin monks that led to the creation of Shaolin Kung Fu. Bodhidharma (also known as Taishi Daruma in Japan) eventually became revered as the founder of Zen Buddhism and is still widely and beneficially accepted as the Father of the Asian Martial Arts. Bodhidharma is thought to have been born in Kanchipuram, near Chennai, India, the third son of a local king and therefore a member of the caste of warriors and rulers. Following his father and Guru’s death, Bodhidharma left his monastery in India to follow his master’s last wish that he go to China and spread the teaching. One can find a lot of similarities among the three. This relationship between a teacher and student in Judo and Karate could have its roots in the Guru-Shishya tradition of India. Kalaripyattu underwent a period of decline during the establishment of British colonial rule in the 19th century. The British banned kalaripayattu for fear of rebellion and anti-colonial sentiment, no doubt fearing its effectiveness. But it then went underground, resurfacing in the 1920s as part of a rediscovery of traditional arts in South India. Kalaripayattu now has a compelling global audience and its fame and glory has won hearts all over. In a Phoenix-like resurrection, Kalaripayattu is today emerging in a new avatar – an ancient art form – a source of inspiration for self-expression in dance forms – both traditional and contemporary, in theatre, in fitness and in movies too. There are over 1000 Kalaris where this art form is taught.